The key to Numatic’s success is the close relationship that has been established with both customers and suppliers worldwide. Many of these relationships have survived throughout the whole lifespan of the company, and indeed, many have entered second and even third generation associations. 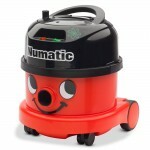 We stock a variety of the Numatic range of vacuum cleaners. Click here for the iconic Henry vacuum. You can see their entire range on their web-site here. If there is anything you are interested in, touch base with us and we can explain the pros and cons and/or suggest an equivalent product.